Let Flexpress help you get complimented on your compliment slips! Compliment slips might seem incidental but it's still important they set the right impression which is why we still use the best quality materials and printing processes available. Flexpress Compliment Slips are printed onto an environmentally friendly 'A' grade branded paper that is fully approved by the FSC so you can be sure of a consistent high-quality look and feel that will always set a god impression. Every job at Flexpress is printed using the finest technology available. You wont receive any products printed on beefed-up photocopiers from us - another reason we back everything with our total satisfaction guarantee. 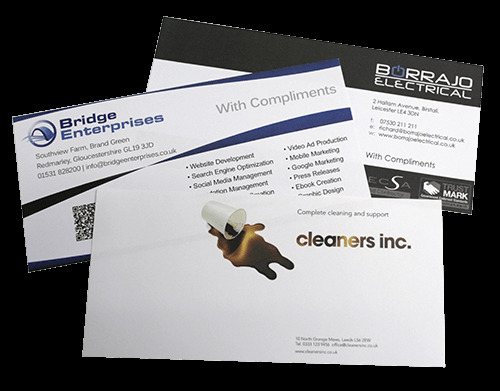 Depending on the quantity ordered, Compliment Slips are printed either lithographically using LED UV inks or for smaller quantities using HP Indigo Offset technology. Our Compliment Slips are trimmed using highly accurate programmatic guillotines. This ensures that even those with tight borders are cut accurately. They're usually packed in strong. plastic boxes for the purpose of convenience and carriage. By selecting this option, the quantity of file copies requested will be packaged and dispatched to you separately to the rest of the order. They will be sent to your main address, by Royal Mail 1st Class, irrespective of where the remainder of the order is being sent. If you do not require this service and are happy to receive file copies as part of the main order simply add the quantity you require to the order and then separate them yourself on receipt. Flexpress started life back in 1989 and are UK based keeping British people in jobs. Everything we offer is printed and finished in-house by us as at our 8000 square foot premises in Leicestershire. We're proud of our facilities and welcome visitors at any time.